Shahpura Bagh Located precisely midway between Jaipur and Udaipur, this peaceful 45-acre wooded estate is one of our favourite destinations in Rajasthan. Beautifully appointed and set in a lush, verdant, estate, 800 square miles of which was originally gifted in 1630 to the present owners’ forebears by the Mughal Emperor Shah Jehan himself for success in battle against the Afghans; this may be a half way pause but will likely catalyze a lifelong affair. Against a backdrop of mango andlime trees, neem, acacia, pepul and date palms, the buildings now used to lodge guests are pukka colonial-era, a sense of which you’ll get, thanks to the sense of light and spaciousness. In a building that’s part bungalow and part flat-roofed cathedral, with a veranda lined by squat white pillars, most guest rooms are vast, double-volume affairs with tall, arched windows that make for plenty of light. The totally renovated bathrooms with walk in glass rain showers and large deep tubs and his and hers washbasins only serve your sense of relaxtaion. The effect is heightened by the bright double-volume interiors, where splendid smooth marble floors are offset by block-printed curtains, rugs, paisley sofas, and cushions in soothing, natural tones. This is a place for calm contemplation and serious relaxation, coupled with three primary distractions: boating (and canoeing, which are monsoon dependent),bird watching, and pool lounging. The large manmade dam along the perimeter of the north and west boundaries of the property is particularly lovely, and is a twitchers paradise (with an island heronry) attracting Sarus Cranes, Marsh Harriers, Eurasian Curlews, and a variety of storks, ducks and geese while the lush forested surrounds attract jungle cats, jackals, and peacocks and hosts a range of resident owls. Outside the immaculate accommodations, Shahpura Bagh has an incredibly homely atmosphere, because it is still the family’s home and is run as such. Ask one of the family members for an anecdote about a particular photograph or picture, and do try challenge your congenial owner/host Sat Singh to try list at least one thing thing that has changed since he grew up here. It’s run with hands-on enthusiasm and genuine concern for guest comfort and personal needs; even the Dalmatian, sausage dog Mitsy, makes you feel welcome. Meals are of the home-cooked variety (pre-arrange authentic Rajasthani cooking lessons), and arrangements can be made to decamp to various romantic spots around the property (poolside is magical) if you tire of meals around the family table (just ask). 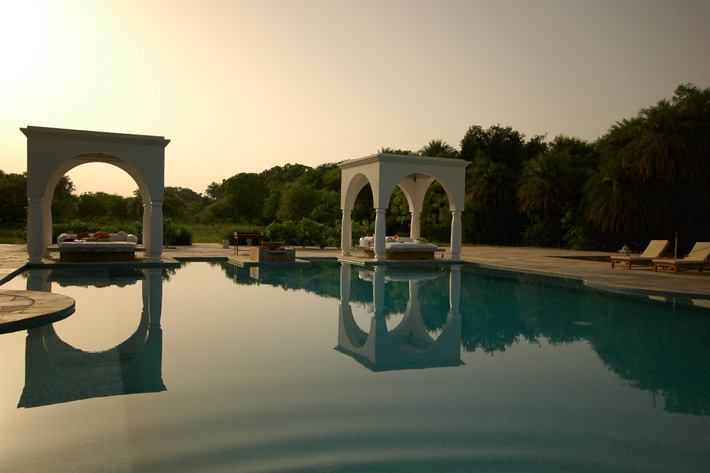 We think their expansive new rimflowpool is one of the best in Rajasthan, presided over by a towering pepul tree and surrounded by peacocks and date palms, it is almost impossible to tear yourself away from its perfect water and luxuriant king size pergolas. Packed lunches for picnic walks and cycle tours make it easy to spend the day exploring the lush surrounds or the quaint adjacent village, where you should investigate phad painting, which originated here and is still practiced by the renowned Vijay Joshi, and snap up the chance to buy a pair of jootis. Followed by giggling children trying to touch your hand or clothes, you will pass old men beating copper pots into perfect shape; tailors working with beautiful fabrics on ancient Singers and ironing garments with old coal-heated irons; huge mounds of orange, red, and yellow spices offset by purple aubergines, red tomatoes, and green peppers; rickshaws carting women adorned in saris of saturated colors; ancient step wells and temples blaring live music—fresh and natural images that will have you grabbing your camera. It won’t be too long, either, before the family’s 400-year-old Dhikola Fort (12km/71/2 miles away) and their nearby sylvan Solitaire is restored and open to guests; until then, do ask to visit on a day trip. 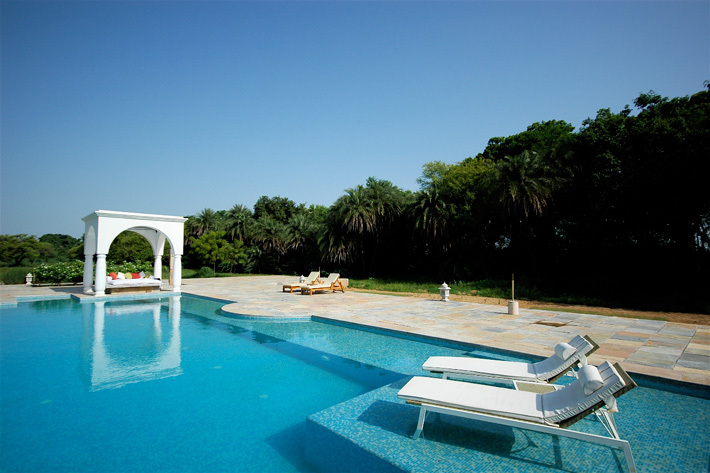 Note: Shahpura comprises 2 residences, one of which is the large colonial “bungalow; which has ben completely restored and is close to the pool, the other is a minute’s walk and is part of the main house with slightly smaller rooms. If travelling with kids it is an option to place them in the main house and take a suite in the other residence. 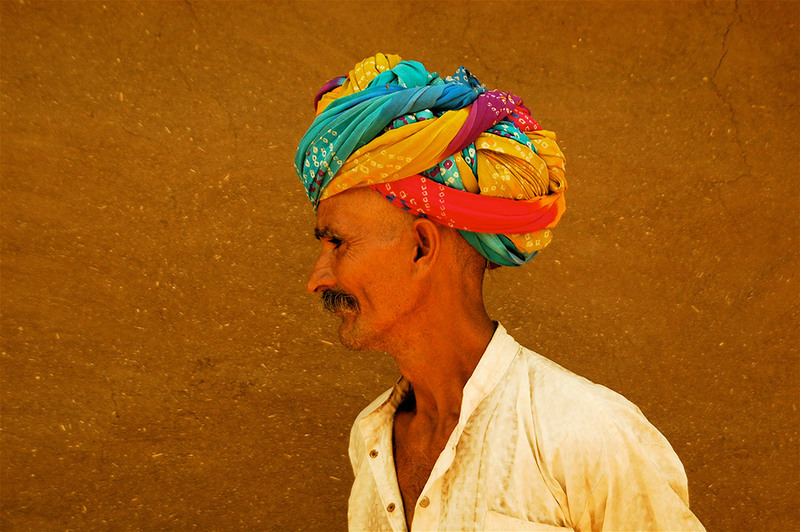 Note: Shahpura Bagh this is also a perfect stop over from Pushkar to Bundi or from Ranthambore to Udaipur or Jodhpur. Shahpura Bagh, District Bhilwara 311 404. [tel] 98-281-22012 or -22013. Fax 01484/22-2077. www.shahpurabagh.com. res@shahpurabagh.com. 10 units. Rs. 10, 500 ; Rs. 14, 500) royal suite; Rs 2,500 extra bed. Rates include breakfast and one jeep safari with non-alcoholic refreshments; taxes extra. 20% discount May–Sept. MC, V. Amenities: Dining room; lounge; bar; bicycles; transfers; room service; laundry; doctor-on-call; library; TV lounge; boating and canoeing; yoga and meditation. In room: A/C, fan, tea- and coffee-making facility, hair dryer, WorldSpace radio, electronic safe, Broadband Internet complimentary.